Patterns. Marc explained service design process is an iteration process where chosen service design tools and methods can be used multiple times and sometimes few steps have to be taken backwards. Marc told patterns can be found from everywhere (See: “Charlie Brooker’s How to Report the News). 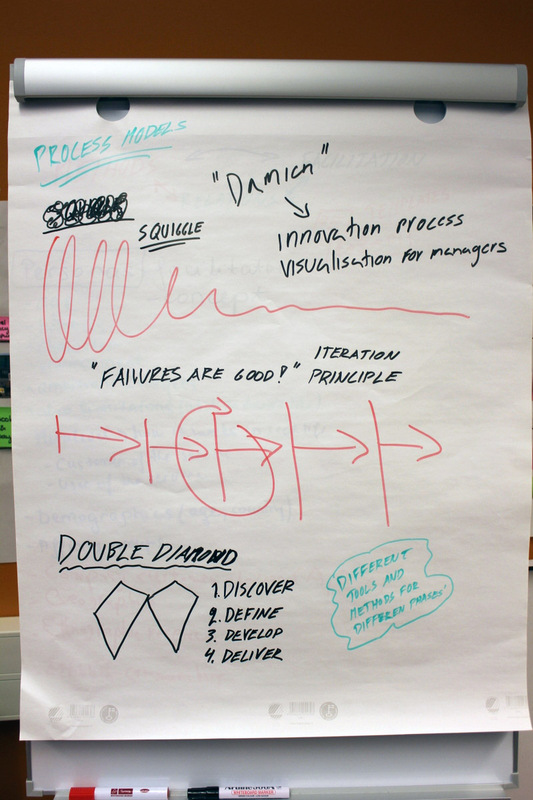 In service design there are also patterns, which facilitator aims to make appear in workshops. Process-focused. 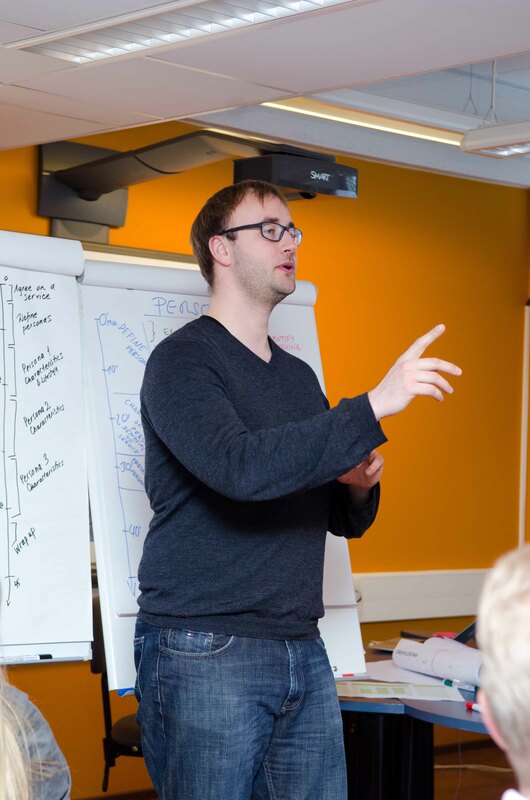 Marc instructed that as a facilitator of a workshop one has to be process-focused, not output-focused. This approach offers higher chance for an output at the end. Participating. Goal of the workshops is to engage all the participants into participation. His approach is that solutions and insights should emerge from inside the organizations instead of bringing them ready from outside. Therefore all the central stakeholders for service have to be involved in the co-creation workshops. This ensures the ownership of the new ideas within the organization. (Tip: Even having administration department in workshop can bring a lot of additional value for ideation). declared to us through Skype Adam Lawrence, from service design agency Work. Play. Experience and co-iniator of Global Service Jam. Have a plan. Marc instructed facilitators to have a plan, but should not let plan become a restriction. By preparing a plan one simplifies the content and makes it easier to remember. (Insight: Marc uses himself a small paper, like a napkin, where he has bullet-points structure). Be flexible. Facilitator has to have an eye for the situation and change settings, if necessary. Safe space makes people more open and is opposite from boardroom settings. (Tip: Designer might ask all the participants to move furniture away from middle of the room and this can make people feel the space as their own). Be aware of situation. Marc shared us the concept of the room. It makes huge matter where the facilitator stands in the room when he is asking questions. Facilitator has to find way to engage people to talk to each other, not just to the facilitator. Having a right mindset is helpful. (Tip: Facilitator should take clients problems seriously, but not taking themselves too seriously. By showing that facilitator is not perfect, people will more easily participate). Have a rubber chicken. See more from theatrical play underneath. Taking benefit of dramatic arc. When did James Bond movies ever gone wrong? By applying similar dramatic arc structure (also called as The boom-wow-wow-wow-boom framework) one can design great service experiences and workshops. Ensure there is a common design language. 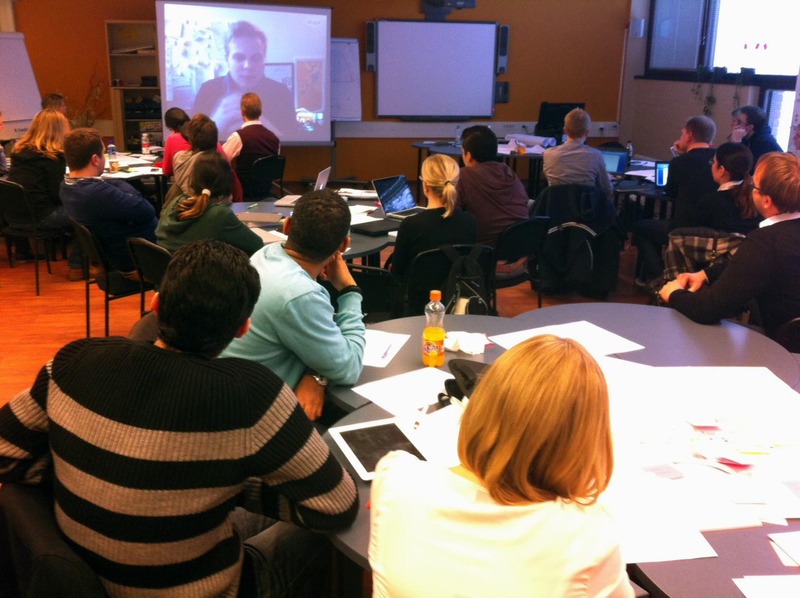 Jakob Schneider , the co-author of the book “This is Service Design: Basics, Tools Cases” (2011) shared us through Skype that there has to be common language with service designers and customers. Communication problems can lead to lost of money, bad service design and possible delays in projects. He also said that there has to be common understanding within design team and co-operation partners: “You need to work with intelligent persons.” he added. … And be prepared for reality. Jakob shared that when having real service design cases, only part of service design tools can be used. In his experience limitations can cause customer’s budget, lack of openness and given time frame. (Tip from Jakob: Sometimes it is necessary to decline customers when there is no common understanding and especially when customer is focused on color and typography matters instead of the big picture). The Business Model Canvas. Marc Stickdorn has developed with Markus Edgar Hormeß “Bridging the Gap” model, which is combining multiple service design tools together to fill in The Business Model Canvas different building blogs such as Stakeholder Map brings insights customers, key resources and key partners. Stakeholder map. Marc described this as the ecosystem of service, which illustrates the exchange of value. It can be used for the service, for the organization or for the customer in the middle, and drawing layers from there on. To build it there are has four steps: 1. Making a broad list of all the stake holders, 2. Prioritize them, 3. Visualizing them to the map and 4. Drawing connections. (Sorry could not find link online for the same awesome Smaply template we used). (Tip: Five Whys can be applied on phase 2)n tools together to fill in The Business Model Canvas different building blogs such as Stakeholder Map brings insights to customers, key resources and key partners. Service blueprinting. Marc explained service blueprinting enlarges the customer journey and shows internal aspects as well. (Insight: He felt that using it has risks of making customer journey too much of a process map, which has not enough visual elements and it can lack some important emphatic points). Mobile ethnography Mobile ethnography allows great and accurate data collection of customer journey, which can be validated easily. Marc introduced us his research project called myServiceFellow. Very handy tool for mobile ethnography (Tip: students and academics can have a free version after launch). Visualization is important part of the service design process. Illustration method is chosen according to the need and circumstances of the workshop. This was an amazing workshop, with lot of new insights and clarity to service design processes. Marc showed with his example how to lead workshop that can be same time really fun and productive. As Marc said: “If you have great group, you can just take it step back and let them do it.”. This is one of the most important things I learned. “The more ***t happens, more you learn.” – Marc. I especially enjoyed Marc’s remark that typical business mindset dislikes failing, but in service design one has to embrace failures in order to make the final designs profitable. 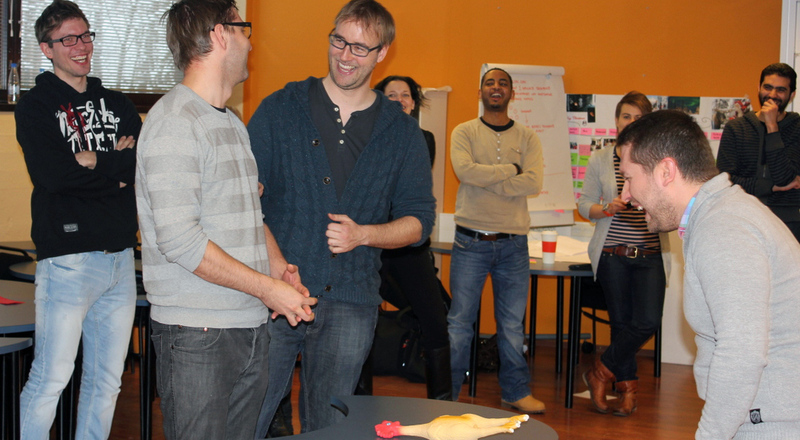 This blog post was created as an assignment in SID course Current Topics of Service Design. ← Are visual design skills important for service designers? If we are going to be innovative, we have to be happy and willing to fail and fail and fail again – and to use that failure to learn and grow. This is crucial, because in most organisations, failure is a problem – if you fail, there is a meeting. Ouch. In workshops with people from these organisations, we need to set up a mental shift. This is why we are playful, use impossible warmups and impossible deadlines, emphasise “sh*tty first drafts”, iterate, iterate, iterate – all to give people the experience that failure is common, acceptable and useful. Thanks again for allowing me to visit your workshop! Hope to see you all that the Jam! thanks for your great feedback and very important correction. Sorry about, I will fix it. Happy to fail – and learn :D.
Btw. I think this dialogue makes this blog post also an iteration process :D.